Back in the later 1980's after moving to Delaware, I began to photograph coastal areas which were serene repositories of waterfowl. I made a series of smaller pastels and dry brush paintings of scenes from White Hall on Delmava to Avalon on the Jersey coast, looking for appealing vistas. Much of the work revolved around meandering inlets and salt-water marshes and I came across some Eastern Shore reserves in which the more common 'Cat-Tail' reeds were not as common as what is called 'Oat-Grass' which I fell in love with because of its wind blown consistency and the many different shades of color that this wetland grass will turn in season after season. And then there were the magnificent Blue Herons that statuesquely paraded in the marshes. The two together gave my paintings an ethereal nature which has carried forth throughout. Serenity, atmospherical, and luminist. These are the qualities of these paintings, all in oil on canvas. Oil provides the luminosity, but it's the thousands of individual brushstrokes that characterize my work, as compared to other artists doing similar scenes. A painting such as "Heron's Respite" may contain half a million brushstrokes. Each is 'woven' into the adjoining threads and so on and so on until a tapestry of color is produced. In this example, the atmospherical quality was further enhanced by a light fog that has settled in over the marsh as the light of day ebbs and a soft peach colored light emanates from the right of the frame, bathing the oat-grass with a misty luminist blanket. The heron is pictured here is almost a sublime 'oriental' abstraction that's simple and pictorial. I chose to understate the heron this time and let the atmosphericals preside. A Delaware artist, Scott Cameron paints the simple elegance of the America’s Cup races, serene coastal marsh scenes, timeless landscape vistas and historic steamboats in a style reminiscent of the era in which they reigned. An admirer of Andrew Wyeth and the Brandywine School of painters, Scott has combined the detail and quiet stillness of that School in his landscapes with the Luminist School’s sense of light glowing from within. A soft gentle atmosphere seems to fall over each scene adding to the peacefulness of the setting, and a sense of a time gone by. His America’s Cup scenes capture the action at a moment in time, allowing the beauty of the wind-filled sails to become the central design element of each painting. 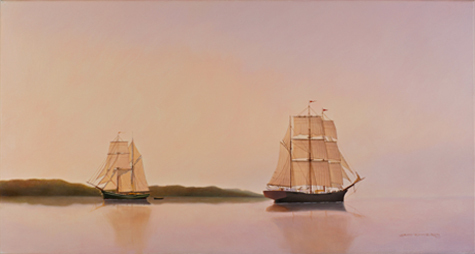 Scott Cameron has exhibited his oil paintings in numerous national and regional shows from the Mystic Seaport Museum to solo and group shows in some of the foremost galleries throughout the Northeast and Mid-Atlantic states. Favorite painting locations are the waterways and coastal inlets of Martha’s Vineyard and Maryland’s Eastern Shore and the gentle rolling landscapes of rural Pennsylvania, Delaware and Maryland. Meticulous research is behind every historic steamboat and America’s Cup painting to record accurately the details of race position, rigging and boat design. Scott Cameron attended Southhampton College on Long Island, studying with Fairfield Porter and Wilhelm KeKooning followed by Pratt Institute in New York. After college Scott worked as a graphic designer in Newport, R.I. designing and executing the graphics for three America’s Cup yachts, Courageous, Clipper and Defender. 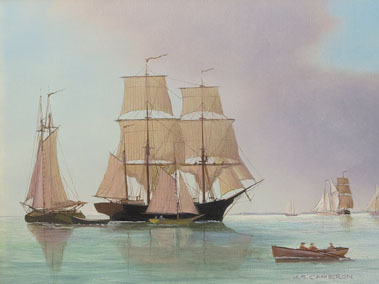 Introduced to this new exciting world of beautiful historical yachts, he determined to become a marine artist, combining his knowledge of graphic design and composition with his love of painting. McBride Gallery is pleased to be present the work of this talented artist.